Amazon has unveiled a bold vision for integrating drones into the skies above our cities, proposing drone superhighways that would crisscross the sky and enable thousands of unmanned vehicles to fly at high speeds under completely automated control. 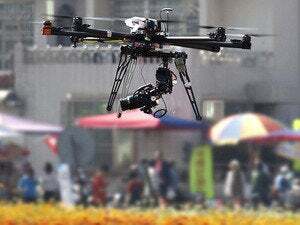 The proposal, delivered at a key industry conference in Silicon Valley on Tuesday, received a cautious welcome from at least one regulator and is the latest move in a back-and-forth between U.S. government regulators and private companies eager to make money off drones. The proposal sees airspace below 500 feet, which is currently largely unregulated but off limits to drones, divided into three distinct bands. From the ground up to 200 feet would be dedicated to low-speed operations, including hobbyists, photographers, agricultural users and others. Drones here would be under manual or automatic control. A band from 200 feet to 400 feet would be for high-speed operation and exclusively under automatic control. Drones would need to be capable of sharing information about their location, flight path and receiving and processing data from others in the area to avoid collisions. The final band, between 400 feet and 500 feet would be a no-fly zone, intended to provide a buffer between drone aviation and regulated airspace. “We feel this is a safe and scalable approach,” said Kimchi. The plan advances proposals for integrating drones into the airspace and, if adopted, would be advantageous for Amazon. It would provide a much simpler environment for Amazon’s proposed Prime Air drones to zip around cities and accomplish their promised task of delivering goods in 30 minutes or less. At present, the Federal Aviation Administration is allowing limited drone use by companies, but all flights are restricted to line-of-sight. That means delivery operations are impractical under current rules. Amazon’s proposal for highly automated flight would allow beyond line-of-sight, which is essential for Prime Air. The proposals were delivered at a conference at NASA’s Ames Research Center, which is working on next-generation air traffic control management systems. The audience included many in the drone industry and representatives from regulators including the FAA. “They really have done careful thinking,” NASA Associate Administrator Jaiwon Shin told IDG News Service, calling the approach fairly reasonable, very practical, and something that all parties can work together to implement. The proposal was also welcomed by Brian Wynne, president of the Association of Unmanned Vehicle Systems, the biggest trade group for the drone industry. But whatever Amazon or the industry proposes, it still needs government acceptance. “At the end of the day, the FAA regulates the airspace, so we have to come together and develop things that the FAA can adopt,” said Wynne.